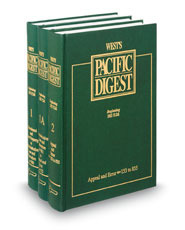 This Key Number Digest contains all headnotes, classified according to West's® Key Number System, for Alaska, Arizona, Colorado, Hawaii, Idaho, Kansas, Montana, Nevada, New Mexico, Oklahoma, Oregon, Utah, Washington, and Wyoming state court decisions. The topics are listed in alphabetical order. The Key Numbers within those topics are listed in numerical order. Each topic begins with scope notes about subjects included and subjects excluded and covered by other topics. Also there is an outline of the topic, which includes a list of all Key Numbers in that topic. Each volume is supplemented by a pocket part and the full set is also supplemented by interim pamphlets. Coverage spans from 1978 to date, starting with vol. 585.